Where can you find 28,200 hectares of dense, lush forest in the outback? 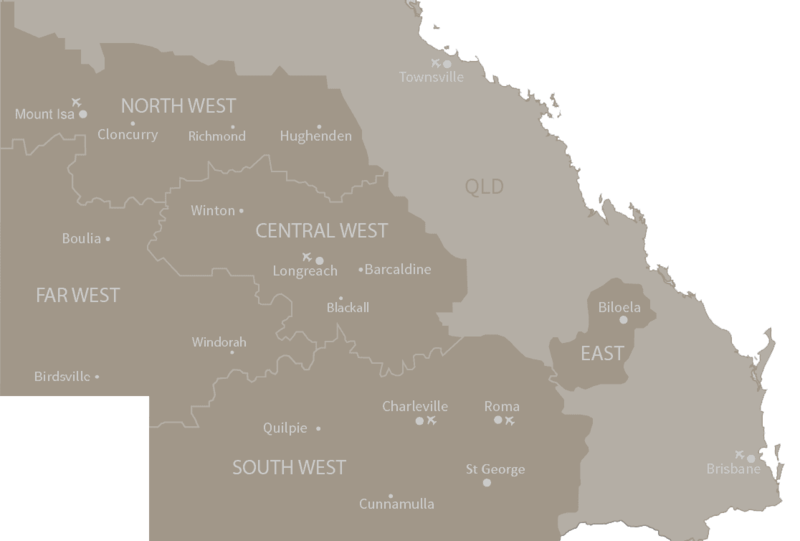 We’ll give you a hint – it’s over 1,000km from the Queensland coast, sits in the north-west pocket of the outback, and the closest township is two hours away. We’re talking about Boodjamullla (Lawn Hill) National Park – sitting pretty in the Gulf Savannah, 350 clicks north-west of Mount Isa. With its emerald waterways winding through lush foliage, framed by towering red sandstone walls, this national park ticks all the boxes for a remote outback escape. And if Chris Hemsworth didn’t convince you in Tourism Australia’s most recent campaign that this outback oasis is worth visiting, then maybe we can. 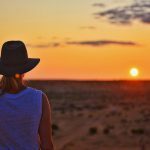 Check out how to explore Boodjamulla (Lawn Hill) National Park in 48 hours. Take to the skies with a 2hr 50 min flight into Mount Isa from Brisbane (or two hours from Townsville), then pick up a rental car to kick your road trip into gear. Burn 4 hours’ worth of rubber (or 10.5 Steve Irwin: The Crocodile Hunter episodes) on the drive from Mount Isa to Boodjamulla (Lawn Hill) National Park. 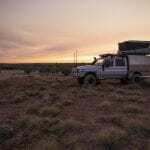 Whether you’re committed to camping or would rather not sacrifice your creature comforts, Adels Grove accommodation park is your outback paradise pad. Only 10km from the entry to the national park, Adels Grove is the closest bed you’ll find if you’re not camping in the park grounds. It’s not slim pickings here – choose from camping, glamping, bunkhouses, cabins, and ensuite rooms, with air-conditioning in all rooms (bar the tents) which you’ll be counting your lucky stars for after a busy day of exploring. The licensed onsite restaurant is the lone wolf in the Adels Grove catering game. Serving bistro-style meals all day long, a two-course set menu posted outside the restaurant each day will have you salivating after a day of adventuring. Soak up the serenity by dining on the restaurant’s deck, where you’re treated to front row seats to watch the sun setting through the trees and the stars emerging in the sky. DIY’ers are also welcome at Adels Grove, with BBQ’s and shared camp kitchen facilities available. Wake up to the tune of chirping birds, rippling watercourses and rustling leaves, because this is one soundtrack you won’t find on Spotify. If you brought your own supplies, a good ol’ cook-up is in order in the shared cooking facilities. If you would prefer someone else does the cooking, the onsite restaurant serves breakfast between 7am-8am each morning. 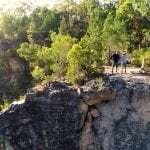 Lace up your walking shoes and point your hat in the direction of Boodjamulla (Lawn Hill) National Park. Release your inner Dundee and take off on your own adventure. If you prefer to leave the compass in the hands of the experts, follow the lead of an Adels Grove tour guide, who will take you along one or all seven walking trails of the park. If your legs are in for a day of moving, the Lawn Hill Campgrounds within the park provide a good stretching home base, as five of the seven trails begin from here. Tackle the 2.6 kilometre ‘Island Stack’ to test your fitness. This one starts off with an easy creek-side stroll, but it gets down to business at the end, with a steep incline up the sandstone ‘stack’, to finish off. Luckily the panoramic, birds-eye views of the gorge that greet you at the top make the workout worth it. For those wanting to challenge their cardio-respiratory systems, the ‘Upper Gorge Lookout’ track is a heart burner. If you’re a seasoned professional in the bushwalking stakes, you’ll be able to cover all 3.6 km in two hours. Walking isn’t the only way to explore this outback oasis – give your legs a rest and pick up a pair of oars for a canoe ride down the gorge. Available for hire from the Lawn Hill campgrounds within the national park, paddle your canoe to Indarri Falls, Middle Gorge, or Upper Gorge. For the perfect Instagram shot, take your camera with you and stop for a break in the middle of the gorge, letting the water become still so you can capture the reflection of the towering sandstone. If the idea of canoeing is already giving you aching arms, opt for an hour-long cruise (via Adels Grove) from the comfort of a solar electric powered pontoon boat. 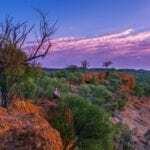 Named as one of our top five sunset spots in the outback, join an Adels Grove tour to Harry’s Hill for a sundowner and a show. A short drive from the accommodation park, kick back and enjoy the colourful skyline with wine and cheese before returning to your accommodation at 7pm for dinner. Embrace your inner Ross Geller and put your palaeontologist hat on, before taking to the Miyumba (Riversleigh) Fossil Fields, at the southern end of Boodjamullla (Lawn Hill) National Park. World Heritage listed in 1994, across 10,000 hectares of the park lies the richest mammal fossil site in the world, with limestone-preserved fossils painting the picture of Australian animals’ evolution. If Sir David Attenborough describes this place as one of the four most important fossil deposits in the world, it’s worth putting it on your Boodjamulla to-do list. Head out on this expedition on your own, or book into a guided tour from Adels Grove, departing at 8am and returning at 12.30pm. If you’re visiting in early July, you’ll be able to spot palaeontologists arriving for their annual dig for these 25-million-year-old fossils. Psst – if you’re keen to dig for dinos, we’ve got your outback dinosaur itinerary here. For those with tired legs, give your eyes a workout with a spot of birdwatching before you go, with over 200 species of birdlife recorded in the national park. Look out for the rare purple-crowned fairy-wren or the buff-sided robin with its distinctive high-pitched call. If you prefer flowers over feathers, explore the 800 species of flora that call Boodjamulla (Lawn Hill) National Park home. Have you visited Adels Grove? Let us know how you spent your time.